With all of the bad press that the ebola virus is getting at the moment, it certainly does not pay to take things for granted, especially when it concerns your health and a disease that has no known cure other than to cross your fingers and hope that you do not end up as one of the statistics. Water is essential to life, and to have a clean supply of water is obviously high on the wish list of many. 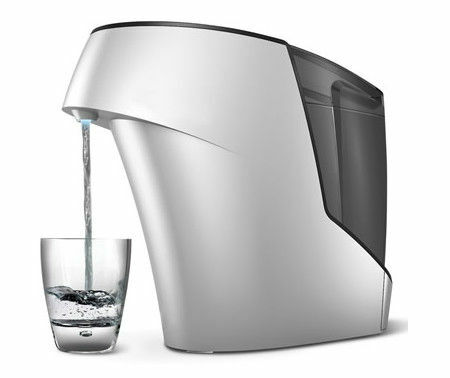 We are told to boil our water before we drink, or to purchase bottled water whenever we are in doubt, so why not go the whole nine yards by picking up the $299.95 Germ Eliminating Water Purifier? The Germ Eliminating Water Purifier is a countertop water purification system that every home should have, as it relies on ultraviolet light to destroy 99.9999% of germs and bacteria. It will make sure that the water that flows through it will undergo a thorough two-step process that will send it through a traditional carbon filter first to get rid of unwanted chemicals and metals. Following that, the water will be treated with the same UV technology used by hospitals to destroy dangerous germs, such as E. coli and salmonella. As water is dispensed, it is also purified, to make sure that recontamination does not occur. Not only that, all the plastic components are BPA-free and coated to resist mold and bacteria.